Slumdog Millionaire - it's only the second movie we've seen in the past two years (the other was The Dark Night!) We needed dinner to soak up all the popcorn we ate- did you know you get free refills on popcorn now? It was too late to get into anything involved, and we didn't have a lot to choose from. 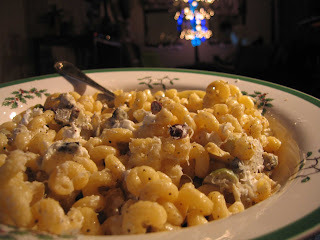 I had toyed with the idea of a mac n cheese but wanted to do something super quick. With the help of a little cheese and pasta water, it mimics a sauce but only takes about 15 minutes total time. And it's slightly healthier than a typical cheese/flour sauce. Try using hot marinated artichokes for a little zing! Oh- and the movie? Two thumbs up! Fabulously done, great story, beautifully shot and a heart wrenching yet fascinating insight into a completely different world. Immediately return pasta to the same pot, adding a simple drizzle of olive oil to the bottom of the pot. Leave the flame off. 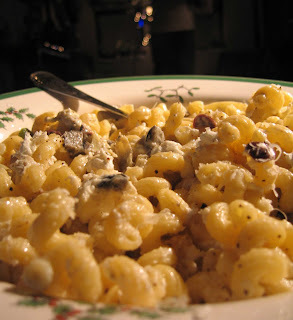 Serve immediately in a large bowl- add grated Pecorino cheese and fresh ground black pepper on top.